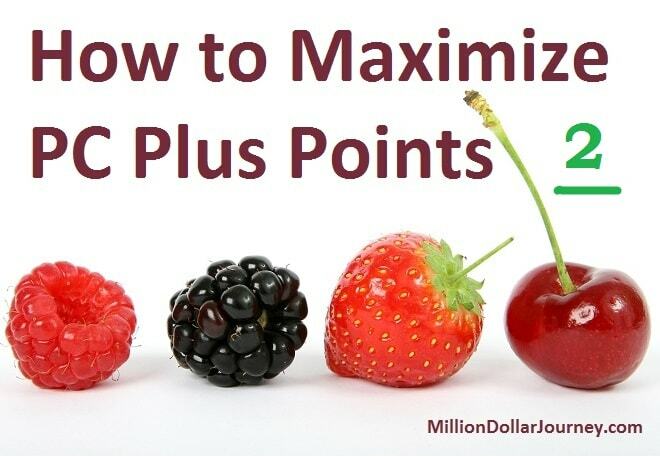 Last weeks article on how to maximize PC Plus points turned out to be quite popular. A number of readers added their tips to the comments (also via email), and the post was mentioned in an online Globe and Mail article (thanks @rcarrick!). The reader tips were so good that I think it deserves a dedicated article on how to really maximize the PC Plus program like the pros. The PC Plus program is an enhancement to the PC points program. When you sign up for the PC Plus program (it’s free), you’ll get a weekly email with specialized offers based on your shopping habits. Personally, I like to use the free phone app which shows your points balance and all your weekly offers in a nice and organized manner. For example, this week, one offer was for 200 pts for every $1 spent on potatoes. Since 20,000 pts = $20, the offer equates to 20% off potatoes. What does Loblaws get in return? Repeat customers, valuable data on your shopping habits, and the ability to apply analytics to shopping trends and other user data. In the PC Plus app, you can swipe left on an offer which will give you the option to save your offer for the following week. This is useful for when it’s a good offer, but you don’t need it this week (or you can wait for the item to go on sale). I used this tip this past weekend with a couple of offers. Stephen: One tip I would like to add is that you can save up to 5 offers at a time for the next week using the app (and again the following week if required). This means if I get a good offer on a product I know I will buy and there isn’t a matching sale, such as 20% off chicken, I will forward that offer to the next week waiting for a better deal. Saving your offer can be used in conjunction with flyer timing. The weekly flyer comes out on Wednesday with a Thursday effective date. Your PC Plus app offers end on Thursday night. This gives you an opportunity to scan through the flyer and save relevant offers in your app before they disappear. Red: New sales start on Thursdays. Your offers end on Thursday at midnight. Go shopping for your offers one last time on Thursday and save the offers you like but didn’t use within the 2 weeks of sales. Maybe that product will go on sale the following week. Repeat until offer can’t be saved anymore. This will probably change on February 1. Similar to the above tip, when you swipe left on an offer, you also have the option to delete. When you delete an offer, it updates the algorithm to show that you aren’t interested in the item, and over time, your offers will (hopefully) become more relevant. Greg: Make sure each week you delete any of your PC offers that you know you will never buy. Over a few months this will ensure the large majority of your offers will be for items you use on a regular basis. This strategy is not as solid, but PC Plus sometimes offers an incentive for points redemption. I recall last year, PC Plus had an “Extreme Redeem” event that gave you bonus points for redeeming points. During the event, for every 50k redeemed, you get 5k back; 100k, 20k back; 200k, 60k. For this reason alone, I try to keep a minimum balance of 50,000 points. A significant number of readers wrote about how they focus their spending on their PCF World Elite Mastercard which generates the bulk of their PC Points. One really good tip was to buy gift cards from Loblaws to take advantage of the 3% back in points. For example, if you are out shopping for Starbucks gift cards for Christmas, why not buy them at a Loblaws gift card kiosk and get a 3% reward for yourself. IanH: We maximize our points by paying for everything on the PC MasterCard. Automated bills, kids days care… anything to pay we use that card. Now that Costco uses MasterCard we use it there as well. We always pay off the card, never carry a balance so it works for us. I think my wife and I average over $1000 a year in earnings. We also use PC Home/Car insurance for the extra points. Been thinking of switching to their mobile phone plan if a good deal presents itself and my wife works near a Loblaws with a Gas Bar so she fill’s up one of the cars there. I used to use PetroCan for gas but going to switch to Esso for the extra points as well. There you have it, four more methods of maximizing the PC Plus program. Essentially, take advantage of the app where you can carry forward offers and delete them for more relevant offers. Use this in conjunction with flyer sales which will result in supercharged savings. Also, occasionally, PC will offer redemption events but that also requires that you maintain a points balance throughout the year. Finally, most readers recommended using the credit card to focus your spending at Loblaws and affiliated stores (ie. Shoppers, Esso, PC Insurance, The Mobile Shop etc). The point redemption bonuses and the saving and deleting of offers are great tips. I was not fully aware of these perks. I am currently at about 35k in points. I am gonna save it and keep a balance of 50k, lol. Excellent tips. Looking forward to Part 3 of this series. Part 3, would point out any changes which occur after the amalgamation date of February 01, 2018. We hadn’t bothered to check our PC points for about five years, and we use PC Financial credit cards for most of our purchases (paying it off in full each month). When we registered our cards on the PC Plus website we were very pleased to discover that we had 782,855 points, which is worth $780! Cool, I didn’t know that there were big ‘redemption days’ (similar to Shoppers Drug Mart), will have to keep an eye out for that. Wonder if this will change come 2018 with the merger with Optimum points? This year alone we have redeemed $470 for free groceries (mainly attributed to the PC Financial World Elite MC)- it’s great! It would be interesting if they started offering 20x PC points days at Shoppers like they currently do with Optimum points. Congrats on the huge savings, I agree, the PCF World Elite credit card is great. We are fortunate (I think) to also have a gas bar at our No Frills store. Fuel purchases quickly add points. On the other hand, I was one of those people who enjoyed using my points to purchase gift cards for various occasions but that option was canceled when Loblaws couldn’t figure out how to avoid fraud. Yes, we love the 10% and sometimes even 20% pts back on ENTIRE grocery bills. Just remember to get separate PC points card accounts for each spouse to maximize the chances of offers. As a result, we achieve over $1000/yr from PC points. Another thing to note is that No Frills sometimes has these get 15,000 bonus pts days for each $100 spent in a purchase. We just break up our purchase into $100 chunks at the register to get multiples. One thing I do NOT like about the new combined plan is that e-mail links do not work the same as the old PC Plus plan. Before, clicking on the link automatically loaded your offers AND showed you the new offers AND you could see your current pts balance WITHOUT logging in. Now you HAVE TO log in. A real nuisance when you want to load and see offers for accounts between spouses… I am hoping they bring back the old behaviour. So if we link our accounts in a “household”, can you confirm that we will still get individual offers? According to the reps, the accounts remain completely independent… “householding” is supposed to simply allow sharing of points more easily. My wife and I have “householded” and we do not receive different offers, on each account. That’s what I was afraid of! I have also read elsewhere that Householding is NOT a good idea as it does seem to impact the offers, diminishing the overall benefit. We too had chosen not to household our points cards and continue to get different offers. It is a bit less practical when it comes time to redeeming but we tend to only do that every 6 months, so it is not so bad. I need a PCFinancial Mastercard. Where do I get an application? Once approved, do I still qualify for 75,000 bonus points, after making a purchase. What amount of purchase qualifies? Thank you.